Despite a significant investment to increase the access to water supplies in Africa, the progress is slow. One of the reasons for this is that there is too much focus on putting in place new infrastructure, and not enough focus on operation and maintenance and the institutional arrangements necessary for ensuring sustainability. In order to incentivize donors and governments to spend more on operation and maintenance, a new indicator was developed. Water-Person-Years takes into account not only the population served by a new infrastructure today, but over the full lifetime of the infrastructure. In order to test this approach with real numbers and integrate factors such as population growth, inflation and interest rates, an economic model was created. 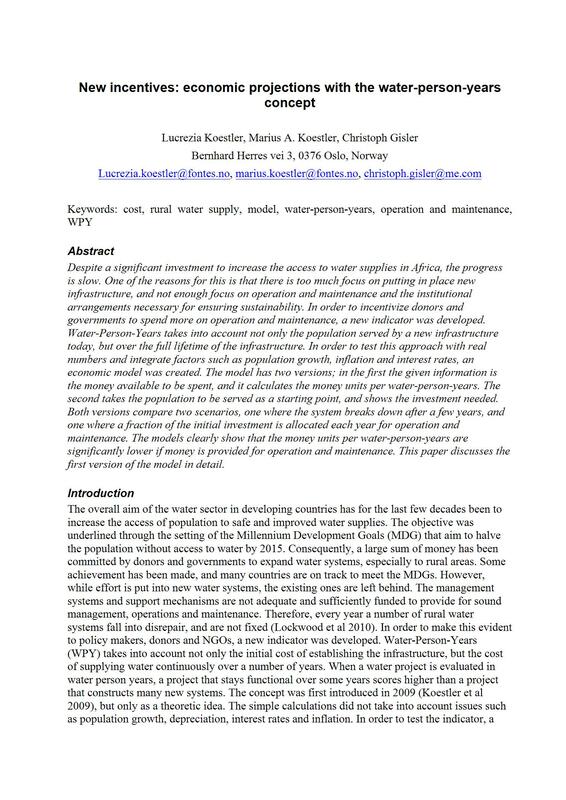 The model has two versions; in the first the given information is the money available to be spent, and it calculates the money units per water-person-years. The second takes the population to be served as a starting point, and shows the investment needed. Both versions compare two scenarios, one where the system breaks down after a few years, and one where a fraction of the initial investment is allocated each year for operation and maintenance. The models clearly show that the money units per water-person-years are significantly lower if money is provided for operation and maintenance. This paper discusses the first version of the model in detail.